Size and description Separated trash in the foot stone. Drainage grates are designed to accept water and can be round, square, or rectangular. It is typically sold with a frame, curb inlet frame, monument box, or bridge drain. Some markets call these slotted covers. 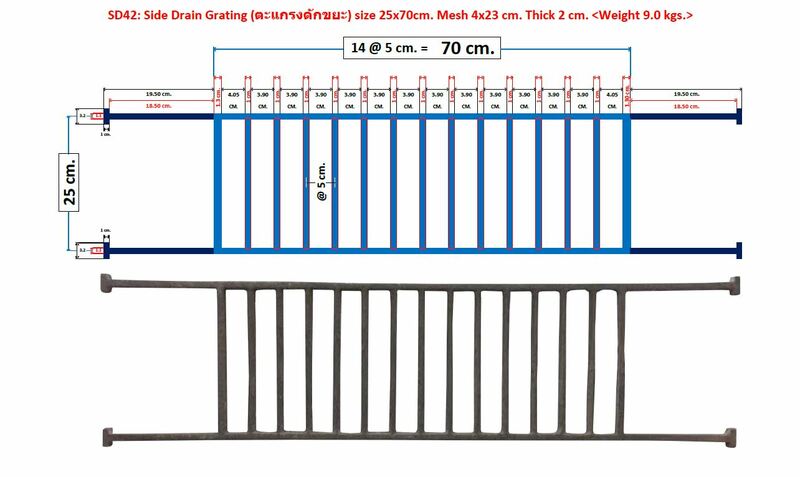 Grating Thai produces and offers a variety of cast iron drain bridge scuppers. the bridge scupper street and construction castings to meet ASTM and AASHTO criteria. In addition, our castings meet federal and state DOT specifications; and other county, city or local standards. Customer choices are typically based on shape, size, load rating, material type, pick options, and lock type. Manhole frames and covers can be round, square or rectangular. They’re typically available as an assembly or set depending on whether assembled together before shipment. Optional “Dump No Waste! Drains To Waterways” and other custom cast-in lettering is an effective way to support local environmental initiatives. Drainage castings or grates are typically sold with a frame, curb inlet frame, monument box, or bridge drain. Some markets call these slotted covers. Specifying the appropriate drainage solution is an important part of a storm water management plan. The wide array of products includes ditch grates, pipe grates, curb and gutter inlets and catch basins.Grating Thai has the trench drainage solution to fit your application from pedestrian areas to airport loading ramps expandable, and available in numerous widths. Designer trench grates may be standalone architectural enhancements, or can accompany matching tree grate designs.Bridge Drain Scupper | Storm Drain Inlets offers an excellent drainage solution for bridge applications. The scupper systems collect water from bridge deck surfaces to convey this water to appropriate positions beneath the bridge. The key advantage on our scuppers is its lightweight construction.A catch basin (storm drain inlet, curb inlet) is an inlet to the storm drain system that typically includes a grate or curb inlet where stormwater enters the catch basin and a sump to capture sediment, debris and associated pollutants. They are also used in combined sewer watersheds to capture floatables and settle some solids. Catch basins act as pretreatment for other treatment practices by capturing large sedime nts. The performance of catch basins at removing sediment and other pollutants depends on the design of the catch basin (e.g., the size of the sump), and routine maintenance to retain the storage available in the sump to capture sediment. Catch basins are used in drainage systems throughout the United States. However, many catch basins are not designed for sediment and pollutant capture. Ideal application of catch basins is as pretreatment to another stormwater management practice. Retrofitting existing catch basins may help to improve their performance substantially. A simple retrofit option of catch basins is to ensure that all catch basins have a hooded outlet to prevent floatable materials, such as trash and debris, from entering th e storm drain system. Some municipalities in the state prefer to recess curb inlets with significant depression to minimize interference with traffic flow. The inlet is recessed from the line of the curb and gutter such that the depression does not extend beyond the gutter line. This may improve driveability; however, the curb transition may pose a hazard to traffic. Curb opening inlets are useful in sag and on-grade situations because of their self-cleansing abilities and hydraulic efficiency. Additionally, they are often preferred over grate inlets because the inlet is placed outside the travel way and poses less of a risk to motorists and bicycle traffic. A drawback of curb opening inlets is that the flowline of the opening is fixed and not readily adaptable to changing pavement levels as occur in surface treatment overlays. Successive overlays can gradually reduce or even eliminate the original opening available for water removal, unless the pavement edge is tapered to the original gutter line. For the most part, grate inlets are used in sag configurations in gutters, adjacent to concrete traffic barriers or rails (where curb inlets would not be practicable), V-shaped gutters with no curb or barrier, and ditches. Grate inlets may also be used at on-grade situations combined with curb inlets. Grate inlets adapt to urban roadway features such as driveways, street intersections, and medians. When grate inlets are specified, the grate configuration and orientation should be compatible with bicycle and wheelchair safety. Access to the storm drain system through a grate inlet is excellent in that, usually, the grate is removable. On the other hand, maintenance of grate inlets can be a continuing problem during the life of the facility; the propensity to collect debris makes grate inlets a constant object of maintenance attention. As such debris accumulates it obstructs the flow of surface water into the inlet. Grate inlets also present potential interference with bicycles and wheelchairs. Linear drains were designed for the interception of wide spread, low flow situations. Applications include intercepting sheet flow from the roadway when collection at a concentration point is not practical, or providing a generalized inlet for stagnate flow on pavements without slope. Linear drains have the advantage that no depression is necessary for hydraulic efficiency. Linear drains may be useful in problematic areas where curb and grate inlets are ineffective, such as along a median barrier, and at super elevation transitions. Linear drains can also be installed transversely across the roadway. However, linear drains have several drawbacks: Linear drains have a high propensity to collect debris in sag configurations. Regular maintenance is required to clear debris from over the drain inlet. Installation can be difficult. Because the inlet is installed flush with the surface of the pavement, placement is critical. Slotted drains consist of a corrugated pipe with an extended slot, or throat, at the top (see Figure 10-5). The throat of a slotted drain inlet is ordinarily reinforced for structural integrity. Slotted Drain Inlet. Slotted drains should be installed with sufficient slope to provide a cleaning velocity for the corrugations. If not, regular cleaning and maintenance must be scheduled on the slotted drain. Clean out access boxes are usually needed at the far end of each slotted drain run to facilitate regular maintenance and cleaning. Trench drains may be precast or cast-in-place. Figure 10-6 illustrates the body and grate of an installed precast trench drain. Precast trench drain. Trench drains have the advantage of a shallower embedment depth and an extremely smooth invert that doesn’t retain sediments, but the disadvantage of having a limited volume because of their size. Trench drains on Department roadways are required to have non-removable grates because removable grates may come loose or move which will create a traffic hazard. The grates specified by the Department have a minimum of 60% open space which allows for cleaning with a vacuum truck or water truck without removing the grates. Combination inlets such as curb and grate can be useful in many configurations, especially sag locations. Because of the inherent debris problem in sags, the combination inlet offers an overflow drain if part of the inlet becomes completely or severely clogged by debris. Maintenance of combination inlets is usually facilitated by the fact that the grate is removable, providing easy access to the inlet and associated storm drain system. Combination inlets used on-grade generally are not cost-effective because of the relatively small additional hydraulic capacity afforded. Authentic data on such combinations are insufficient to establish accurate factors for determining the true capacity of a combination inlet. For a combination curb and grate, assume that the capacity of the combination inlet comprises the sum of the capacity of the grate and the upstream curb opening length. Ignore the capacity of the curb opening that is adjacent to the grate opening. An inlet in a sag configuration is considered the “end of the line” because the water and its debris load have no other place to go. Because of this, failure of an inlet in a sag configuration often represents a threat to the successful operation of a storm drain system. Therefore, the hydraulic designer must consider some additional items such as complex ponded width and complex approach slopes. In a sag configuration, the controlling ponded width can be from one of two origins. The inlet itself may cause a head that translates to a ponded width, and the flow in the curb and gutter from each direction subtends its own ponded width. If the sag is in a vertical curve, the slope at the sag is zero, which would mean that there is no gutter capacity. In reality there is a three-dimensional flow pattern resulting from the drawdown effect of the inlet. As an approximation, one reasonable approach is to assume a longitudinal slope of one half of the tangent grade. Because the water or its debris load can go no other place, an appropriate safety factor should be applied to the inlet size. For grate inlets in sags, the usual safety factor is approximately two; for curb inlets, the factor can be somewhat less. In application, the factor of safety for a grate inlet is applied as a safety reduction factor, or clogging factor. For example, a safety factor of 2 would result in a clogging factor of 50%, which assumes that half the grate is clogged by debris. Where significant ponding can occur such as in an underpass and in a sag-vertical curve, good engineering practice is to place flanking inlets on each side of the sag location inlet to relieve some or most of the flow burden on the inlet in sag. Flanking inlets should be analyzed as inlets on-grade at some specified distance (usually 50 or 100 feet) away from the low point on the sag vertical curve. Drains or inlets appearing in ditches and medians are usually grate inlets and are also termed “drop inlets.” The operation of the inlet is enhanced by a concrete riprap collar that forms a type of bowl around the inlet. Often, such an inlet is in a sag (sump) configuration created by a ditch block. Department research ( 0-5823-1) indicates that a six inch ditch block may not be adequate to ensure complete capture of flow; a taller ditch block may be necessary. However, the designer must either determine the required depth for complete capture, or account for flow over the ditch block to the next inlet. Care must be taken to ensure that the ditch block slopes meet clear zone standards. Drainage chutes, also referred to as over-side drains or curb slots, are commonly used at the ends of bridges to either prevent flow from running onto a bridge deck, or to prevent flow from running off a bridge deck onto the pavement. There may be other locations where a drainage chute or curb cut may be useful in removing flow from the pavement where no storm drainage system is present and where suitable outfall is present behind the curb and gutter section. In most cases, an opening in the curb connects to a scour-resistant channel or chute which prevents erosion of the embankment or slope. In some instances, the channel or chute may be replaced with a pipe placed in the roadway embankment as illustrated in Figure 10-8. This treatment facilitates mowing and other maintenance but also introduces its own maintenance needs to keep it from clogging. The inlet location may be dictated either by roadway elements, hydraulic requirements, or both. Inlets should be placed upstream of roadway elements such as sags, street intersections, gore islands (see Figure 10-9), super elevation transitions, driveways, cross-walks, and curb ramps (see Bypass Flow Design Approach). Flow across intersections, ramps, and to a lesser extent, driveways, may cause a traffic hazard, while flow across cross-walks and curb ramps may cause a pedestrian hazard. Inlets at these locations should be designed to capture 100% of the flow. Inlets should also be located hydraulically to prevent excessive gutter flow and excessive ponding. Drain inlets collect water from roads and parking lots and convey it to an underground storm drain system. Drain inlets incorporated into a curb and gutter systems are called curb inlets. Drain inlets have minimal water quality benefit alone; however, in a developed watershed they are often a necessary component of a drainage system that as a whole has a water quality benefit. There are design elements that can be incorporated into a drain inlet to achieve some water quality benefit. APPLICABILITY Drain inlets are suitable along paved roads, parking lots, paved swales, or rock-lined ditches where permanent storm drain system are currently installed or planned to be. Drain inlets Advantages Prevents discharge of degraded runoff water from roadside ditches and Reduces discharge velocity from culverts/curbs by dissipating energy. ຈັ່ນຈັບ sieve ຝຸ່ນ, ຂີ້ເຫຍື້ອ, ໃບດ້ານຄວບຄຸມຢູ່ແຄມ sidewalk ໄດ້. Specifications Scouting Grates ຂະຫນາດແລະລາຍລະອຽດ ຂີ້ເຫຍື້ອຂີ້ເຫຍື້ອຂີ້ເຫຍື້ອໃນແກນຕີນ. SD23: ຄວບຄຸມລະບາຍ Grates Scupper ຈັ່ນຈັບ sieve ສິ່ງເສດເຫຼືອກ່ຽວກັບການຄວບຄຸມກ່ຽວກັບການ sidewalk ໄດ້ . 15x50cm ຂະຫນາດຕາຫນ່າງ 3.3×12 ຊົມຫນາ. 1 ຊມ 24 ກົກນ້ໍາຫນັກ..
SD24: ຄວບຄຸມລະບາຍ Grates Scupper ຈັ່ນຈັບ sieve ສິ່ງເສດເຫຼືອກ່ຽວກັບການຄວບຄຸມກ່ຽວກັບການ sidewalk ໄດ້ . 15x60cm ຂະຫນາດຕາຫນ່າງ 4×14 cm ຫນາ. 2 ຊມນ້ໍາຫນັກ 42 kg..
SD25: ຂີ້ເຫຍື້ອຂີ້ເຫຍື້ອ Scupper Grash Scrapper ຖັງຂີ້ເຫຍື້ອຢູ່ຫີນຂ້າງ ຕີນເບກຂະຫນາດ 15×70 ຊມ 4×14 ຊຕມຫນັກ 2 ຊມຫນັກ 5 ກົກ. SD31: ຂີ້ເຫຍື້ອຂີ້ເຫຍື້ອ Scupper ຂີ້ເຫຍື້ອຢູ່ໃນຫີນຂ້າງ ຕີນຂອງຕີນຂະຫນາດ 20x57cm ເມັດ 35×15 ຊຕມຫນາ 2 ຊມນ້ໍາຫນັກ 46 ກົກ. Side ບາດວິຖີບາຍນ້ໍາຖະຫນົນລົດແລ່ນ Grating (ຈັ່ນຈັບ sieve ສິ່ງເສດເຫຼືອການຜະລິດລະລາຍຢ່າງຮຸນແຮງ) ໄດ້ຂະຫນາດ:. 180 525 ໄດ້ x ການ x 180 mm Breakthrough (The Wide ເພງຄວາມຍາວຂອງ x ທີ່ x Hight): ຫນາ 35 ມມ Breakthrough. ພວກເຮົາປະຕິບັດປະເພດທັງຫມົດຂອງຫລັງຄາປັດ ,,, ທໍ່ລະບາຍໃຫມ່ມຸງການ, ປັດ overflow A, ເປັນ retrofit ປັດ ,, ເດັກ, ລະບຽງ, Deck ປັດ, ປັດຊັ້ນກັບຫລັງຄາ, ເດັກ, ອຸປະກອນເສີມສະກຸນເງິນແລະເປັນທີ່ Scupper ປັດທົດແທນ Universal ເທິງຫລັງຄາ, ເດັກ, ພາກສ່ວນເຄື່ອງມື. ວິທີການ້ໍາຂອງພວກເຮົາປະກອບມີທັງນ້ໍາດື່ມທີ່ມີການຄ້າແລະອາໃສຢູ່. ບໍ່ວ່າທ່ານຕ້ອງການຂີ້ຝຸ່ນຫຼືໂງ່ສໍາລັບການກໍ່ສ້າງໃຫມ່ຫຼືການກໍ່ສ້າງ, ພວກເຮົາມີສິ່ງທີ່ທ່ານຕ້ອງການ. ວິທີການຂະຫນາດທໍ່ໄຫຼ.ການວາງສະແດງແລະທາງເລືອກໃນການລະບາຍນ້ໍາໃນທາງດ່ວນແມ່ນບັນຫາສໍາລັບນັກຂັບຂີ່. gullies Highway – pits ການລະບາຍການຄຸ້ມຄອງໂດຍການຮູ້ບຸນຄຸນໂລຫະເປີດຢູ່ໃນຂອບຖະຫນົນຫົນທາງໄດ້ – ມີຄວາມກັງວົນຕົ້ນຕໍໃນການຄວາມປອດໄພຂອງຜູ້ຂັບຂີ່ລົດ. ກ່ຽວກັບທະເລໃນການເຄົ້າໄຮເວຮູ້ບຸນຄຸນໂລຫະຂອງ gullies ໄດ້ດໍາເນີນການໃນອັນດຽວກັນຫລືຄ້າຍຄືກັນ, ທິດທາງຂອງລົດຖີບເມື່ອຍແທນທີ່ຈະກ່ວາ perpendicular; ຄູ່ກັບສະຖານລະຫວ່າງຕະແກງໄດ້ກາຍຂອບເຂດຄວາມກວ້າງຢາງລົດຖີບທົ່ວໄປ, ບໍ່ມີຢູ່ອາດຈະສູງຂອງຢາງຈັບແກງໃນຂະນະທີ່ transversing gullies ໄດ້. ນອກຈາກນັ້ນ, ບ່ອນນັ່ງຢູ່ທົ່ວໄປຂອງພວກເຂົາຢູ່ໃນບ່າໄດ້ຊ່ວຍຫຼຸດຜ່ອນຄວາມກວ້າງຂອງໄຫລ່ທີ່ປະສິດທິຜົນ. ອັນຕະລາຍທີ່ກ່ຽວຂ້ອງກັບຕະແກງລະບາຍກ່ຽວກັບທາງດ່ວນແມ່ນເພີ່ມຂຶ້ນໂດຍອັນຕະລາຍທີ່ທຸກຍາກຫມາຍ: ຈໍານວນຫນ້ອຍໄດ້ມີປ້າຍທີ່ມີອາການເຕືອນ, ໃນຂະນະທີ່ເຄື່ອງຫມາຍສີໄດ້ມັກຈະ worn ຮ້າຍແຮງ. Scuppers – ການເປີດບັນດາສິ່ງກີດຂວາງທາງດ້ານຊີມັງເພື່ອຫລຸດນ້ໍາ – ແມ່ນພົບຢູ່ຕາມທາງດ່ວນແລະບໍ່ມີໄພຂົ່ມຂູ່ຕໍ່ນັກແລ່ນຂີ່ຈັກກະວານ; ການນໍາໃຊ້ຂອງພວກເຂົາໃນການຂັບຂີ່ທາງດ່ວນຄວນເປັນມາດຕະຖານເວັ້ນເສຍແຕ່ວ່າສະພາບຖະຫນົນແລະລະບຽບການບໍ່ອະນຸຍາດໃຫ້ນໍາໃຊ້. ບ່ອນທີ່ scuppers ບໍ່ສາມາດໃຊ້ໄດ້, drains “Bike ປອດໄພ” ແມ່ນການທົດແທນທີ່ເຫມາະສົມທີ່ຕອບສະຫນອງລະບຽບການທາງດ່ວນ. ກະແສກະແສນ້ໍາຂົ້ນແຍກແຍກເປືອກຝຸ່ນທີ່ລອຍຕົວເຂົ້າໄປໃນຫນອງຢູ່ຕີນຂອງຕີນ. ຂີ້ຝຸ່ນ, ຂີ້ເຫຍື້ອ, ສິ່ງເສດເຫຼືອ, ອາຫານ, ໃບ, ເຈ້ຍ, ກ້ອນຫີນ, ກ່ອງ, ຂີ້ເຫຍື້ອ ເສັ້ນຂ້າງໃນຮູບ U ຢູ່ທາງຂ້າງ. ຜະລິດແລະອອກແບບຕາມມາດຕະຖານຂອງເທດສະບານ. ກະຊວງສາທາລະນະສຸກແລະເມືອງແລະການວາງແຜນປະເທດກະຊວງຖະຫນົນຫົນທາງຊົນນະບົດ ອົງການປົກຄອງແຫ່ງຊາດ ETA Trench ຈໍລະບາຍຂີ້ຝຸ່ນຖະຫນົນ grating ໃກ້ Footbath, trapper ໃບ scupper ຄວາມປອດໄພຕະແກງຈະລາຈອນລະບາຍຕາມຂ້າງຂອງທາງດ່ວນ. ເມື່ອຝົນຕົກ, ນໍ້າໄຫຼອອກຈາກຖະຫນົນຫົນທາງ, ບ່ອນຈອດລົດ, ຫລັງຄາເຮືອນແລະຫນ້າດິນອື່ນໆ, ເຂົ້າໄປໃນນ້ໍາທີ່ໃກ້ທີ່ສຸດ. ການປະຕິບັດງານນີ້ສາມາດຖືກກໍານົດວ່າເປັນໄພນໍ້າຖ້ວມ. ສາຍນ້ໍາໄຫຼລົງສາມາດເຂົ້າໄປທາງນ້ໍາຜ່ານທາງເຄືອຂ່າຍທໍ່ໃຕ້ດິນຫຼືເປັນພື້ນທີ່ແລ່ນອອກໄປ. ເຂດຕົວເມືອງສ່ວນຫຼາຍແມ່ນມີນ້ໍາປະປາທີ່ມີຈຸດເຂົ້າສູ່ລະບົບນໍ້າຖ້ວມ. ໃນບາງເຂດຕົວເມືອງໂດຍສະເພາະແມ່ນຢູ່ໃນຕົວເມືອງຊົນນະບົດ, ອາດຈະບໍ່ມີພື້ນຖານໂຄງລ່າງທາງນ້ໍາແລະນ້ໍາຖ້ວມແມ່ນຂີ້ເຫຍື້ອຜ່ານທໍ່ນ້ໍາ. ພວກເຮົາປະເມີນຄວາມເປັນໄປໄດ້ຂອງເຫດການດັ່ງກ່າວ, ໃນແງ່ຂອງຄວາມເຂັ້ມຂຸ້ນແລະໄລຍະເວລາທີ່ກໍານົດແລະຈໍານວນຂອງການ runoff ທີ່ຄາດວ່າຈະມີ. ພວກເຮົານໍາໃຊ້ຂໍ້ມູນນີ້ເພື່ອອອກແບບນ້ໍາແລະທໍ່ເພື່ອນໍານ້ໍາໄປສູ່ເສັ້ນທາງທີ່ເຫມາະສົມທີ່ສຸດ. ໃນແຕ່ລະຊ່ວງເວລາ, ເຫດການກ່ຽວກັບຝົນຕົກອາດຈະຮ້າຍແຮງແລະເກີນຄວາມສາມາດຂອງລະບົບນໍ້າຖ້ວມຂອງພວກເຮົາ. ນ້ໍາຮົ້ວຂ້າງ, ຫຼືທໍ່ນ້ໍາ, ສະຫນອງການລະບາຍນ້ໍາຢູ່ໃນເຂດພື້ນທີ່ paved ເຊັ່ນ: sidewalk ແລະບ່ອນຈອດລົດ lots. ໃນເວລາທີ່ຖະຫນົນຫົນທາງແລ່ນໄປຄຽງຄູ່ກັບອາຄານກໍ່ສາມາດຮຽກຮ້ອງໃຫ້ມີການລະບາຍນ້ໍາແບບເລິກເຊິ່ງເພື່ອສະແດງຄວາມເສຍຫາຍຈາກມຸງຫລັງຈາກການຫຼຸດລົງຈາກການກໍ່ສ້າງໃນເວລາທີ່ຍອມຮັບແຜ່ນທີ່ໄຫຼອອກຈາກຖະຫນົນ. ນ້ໍາຮ່ອງຮອຍແມ່ນຖືກນໍາໃຊ້ພ້ອມກັບເກີບດູດຝຸ່ນເພື່ອຮັບປະກັນວ່າມີເສັ້ນທາງຍ່າງຕີນດີແລະມີນ້ໍາປະປາທີ່ມີປະສິດທິພາບ. ພວກເຮົາສະຫນອງນ້ໍາສຽງໂຫວດທັງຫມົດທີ່ມີນ້ໍາມັນເຫຼື້ອມໃສດ້ວຍການອອກແບບຕ່າງໆທີ່ມີຄວາມປອດໄພແລະການອອກກໍາລັງກາຍແບບ pedestrian. ຮູບແບບຕ່າງໆທີ່ມີຮູບແບບທີ່ທົນທານຕໍ່ການລະເມີດສູນກາງຖືກສະຫນອງໃຫ້ເພື່ອຕອບສະຫນອງຄວາມຕ້ອງການຂອງເວັບໄຊທ໌ໃດຫນຶ່ງ. ປະຕູຮົ້ວ Sidewalk ສາມາດມີການຈະລາຈອນເຊັ່ນດຽວກັນກັບຂີ້ເຫຍື້ອທີ່ປອດໄພສໍາລັບ pedestrian ໃນຫຼາຍຂະຫນາດ. GFRP Composite ເພັດ Top Manhole ປົກ Checker Plate ພື້ນຜິວ (ຫນາ grill lid ປິດຂີ້ເຫຍື້ອການປົກຫຸ້ມຂອງທໍ່ນ້ໍ Fiber Glass Mat) www.chancon.co.th. ໄຂ່ Polystyrene ສີຂາວສໍາລັບການກັບຄືນອາກາດແລະການລະບາຍ ຕົກແຕ່ງຕູ້ປາ EggCrate Fluorescent ເພດານ Grille ເຮັດໃຫ້ມີແສງຫນ້າຈໍກອງ Media Diffusers Panel, DIY ບົດຄັດຫຍໍ້ວັດສະດຸພາດສະຕິກກະດານຫນອງນ້ໍາຕູ້ປາ, ອາກາດ vector ຄືນ acrylic HVAC / deflection Double Grid ອາກາດ, vivarium terrarium ສໍາລັບການສ້າງຕາຂ່າຍໄຟຟ້າກະດານສໍາລັບການສະກັດແສງສະຫວ່າງຊ່ອງຫວ່າງ. ຈາກ LED / Fluorescent Lamps (Led / Fluorescent) ແຜ່ນປິດຝາຄອບແຜງຫນ້າຈໍ Louver ກວມເອົາການກໍ່ສ້າງລະບົບໄຟຟ້າ. ກະດານແສງສະຫວ່າງ, ຕູ້ສະແດງຜົນອອກແບບ ໃຊ້ເພື່ອທົດແທນອາກາດເພດານອາລູມິນຽມ. ການນໍາໃຊ້ເປັນການຕົບແຕ່ງສໍາລັບປາງາມ. ຝາຜະຫນັງຊິ້ນສ່ວນ, ຫນອງ, ຕູ້ປາ, ກຸ້ງ, ກົບ, salamanders ອຸປະກອນແສງສະຫວ່າງ ຕົກແຕ່ງຕູ້ປາ EggCrate Fluorescent ເພດານ Grille ເຮັດໃຫ້ມີແສງຫນ້າຈໍກອງ Media Diffusers Panel, DIY ບົດຄັດຫຍໍ້ວັດສະດຸພາດສະຕິກກະດານຫນອງນ້ໍາຕູ້ປາ, ອາກາດ vector ຄືນ acrylic HVAC / deflection Double Grid ອາກາດ, vivarium terrarium ສໍາລັບການສ້າງຕາຂ່າຍໄຟຟ້າກະດານສໍາລັບການສະກັດແສງສະຫວ່າງຊ່ອງຫວ່າງ. ຈາກ LED / Fluorescent Lamps (Led / Fluorescent) ແຜ່ນປິດຝາຄອບແຜງຫນ້າຈໍ Louver ກວມເອົາການກໍ່ສ້າງລະບົບໄຟຟ້າ. ກະດານແສງສະຫວ່າງ, ຕູ້ສະແດງຜົນອອກແບບ ໃຊ້ເພື່ອທົດແທນອາກາດເພດານອາລູມິນຽມ. ການນໍາໃຊ້ເປັນການຕົບແຕ່ງສໍາລັບປາງາມ. ຝາຜະຫນັງຊິ້ນສ່ວນ, ຫນອງ, ຕູ້ປາ, ກຸ້ງ, ກົບ, salamanders ອຸປະກອນແສງສະຫວ່າງ ຕົກແຕ່ງຕູ້ປາ EggCrate Fluorescent ເພດານ Grille ເຮັດໃຫ້ມີແສງຫນ້າຈໍກອງ Media Diffusers Panel, DIY ບົດຄັດຫຍໍ້ວັດສະດຸພາດສະຕິກກະດານຫນອງນ້ໍາຕູ້ປາ, ອາກາດ vector ຄືນ acrylic HVAC / deflection Double Grid ອາກາດ, vivarium terrarium ສໍາລັບການສ້າງຕາຂ່າຍໄຟຟ້າກະດານສໍາລັບການສະກັດແສງສະຫວ່າງຊ່ອງຫວ່າງ. ຈາກ LED / Fluorescent Lamps (Led / Fluorescent) ແຜ່ນປິດຝາຄອບແຜງຫນ້າຈໍ Louver ກວມເອົາການກໍ່ສ້າງລະບົບໄຟຟ້າ. ກະດານແສງສະຫວ່າງ, ຕູ້ສະແດງຜົນອອກແບບ ໃຊ້ເພື່ອທົດແທນອາກາດເພດານອາລູມິນຽມ. ການນໍາໃຊ້ເປັນການຕົບແຕ່ງສໍາລັບປາງາມ. ຝາຜະຫນັງຊິ້ນສ່ວນ, ຫນອງ, ຕູ້ປາ, ກຸ້ງ, ກົບ, salamanders vivarium terrarium ສໍາລັບການສ້າງສະຖານທີ່ຄະນະກໍາມະຕາຂ່າຍໄຟຟ້າເພື່ອປ້ອງກັນແສງສະຫວ່າງຈາກໂຄມໄຟ LED / ສະທ້ອນແສງເຊນ (Led / Fluorescent) ແຜ່ນປິດຝາຄອບແຜງຫນ້າຈໍ Louver ກວມເອົາການກໍ່ສ້າງລະບົບໄຟຟ້າ. ກະດານແສງສະຫວ່າງ, ຕູ້ສະແດງຜົນອອກແບບ ໃຊ້ເພື່ອທົດແທນອາກາດເພດານອາລູມິນຽມ. ການນໍາໃຊ້ເປັນການຕົບແຕ່ງສໍາລັບປາງາມ. ຝາຜະຫນັງຊິ້ນສ່ວນ, ຫນອງ, ຕູ້ປາ, ກຸ້ງ, ກົບ, salamanders vivarium terrarium ສໍາລັບການສ້າງສະຖານທີ່ຄະນະກໍາມະຕາຂ່າຍໄຟຟ້າເພື່ອປ້ອງກັນແສງສະຫວ່າງຈາກໂຄມໄຟ LED / ສະທ້ອນແສງເຊນ (Led / Fluorescent) ແຜ່ນປິດຝາຄອບແຜງຫນ້າຈໍ Louver ກວມເອົາການກໍ່ສ້າງລະບົບໄຟຟ້າ. ກະດານແສງສະຫວ່າງ, ຕູ້ສະແດງຜົນອອກແບບ ໃຊ້ເພື່ອທົດແທນອາກາດເພດານອາລູມິນຽມ. ການນໍາໃຊ້ເປັນການຕົບແຕ່ງສໍາລັບປາງາມ. ຝາຜະຫນັງຊິ້ນສ່ວນ, ຫນອງ, ຕູ້ປາ, ຖັງກຸ້ງ, ກົບ salamander. ກ່ອງພາດສະຕິກ ABS ມີຂະຫນາດມາດຕະຖານຂະຫນາດ 25cm ແລະ 30cm ມີສອງຊັ້ນທີ່ມີຄຸນະພາບທີ່ຈະເລືອກເອົານ້ໍາຫນັກເບົາ, ບໍ່ແມ່ນຂີ້ເຫຍື້ອທີ່ຈະຜ່ານຄົນ. ລາຄາຖືກທີ່ສຸດ ເຫມາະສໍາລັບການນໍາໃຊ້ໃນລົ່ມ. ອ້ອມຂ້າງສະລອຍນ້ໍາ ພື້ນທີ່ໂດຍບໍ່ມີລົດທີ່ແລ່ນຜ່ານທໍ່ສາມາດໃຊ້ໄດ້ກັບຮູບຮ່າງຂອງເສັ້ນໂຄ້ງ. 3. Hotdip Galvanized (HDG) Iron Metal Steel Grating. ຮ້ອນຊ້ວນ galvanized ເຫລໍກຮ້ອນ galvanized ແຜ່ນເຫຼັກ. ເພື່ອຈະໄດ້ຮັບການເຊື່ອມໂລຫະດ້ວຍລະບົບ CO2, ຫຸ່ນຍົນເຮັດໃຫ້ການເຊື່ອມໂລຫະເຫຼັກຫຼາຍກ່ວາການເຊື່ອມໂລຫະດ້ວຍມືແລະຫຼັງຈາກນັ້ນໃສ່ HDG. ປະໂຫຍດແມ່ນວ່າມັນແຂງແຮງກວ່າວັດສະດຸທັງຫມົດ. ຂໍ້ເສຍປຽບແມ່ນການຂີ້ເຫຍື້ອ. ແລະລັກຂະຫນາດ 25x100cm. ແລະ 30x100cm. 4. FRP, Fiberglass Grill / Mold grating ເສັ້ນໃຍຮູ້ບຸນຄຸນແກ້ວ, reinforced ຊິນ.“ຕາຂ່າຍໄຟຟ້າ FRP” ແທນເຕົາລີດ / ສະແຕນເລດເຫຼັກ ຜະລິດດ້ວຍເສັ້ນໃຍຢາງທີ່ມີຄວາມເຂັ້ມແຂງ, ມີນ້ໍາຫນັກເບົາ, ທົນທານຕໍ່ສານເຄມີ, ບໍ່ມີຂີ້ເຫຍື້ອ, ທົນທານຕໍ່ UV, ແສງແດດບໍ່ແຕກ, ກາວຫຼືອາກາດ. Thief ບໍ່ຕ້ອງການ ການບໍາລຸງຮັກສາງ່າຍດາຍ ຊີວິດຂອງ 50-100 ປີແມ່ນເປັນເອກະສານທາງເລືອກໃຫມ່. ເລືອກສີທີ່ເຫມາະສົມເພື່ອໃຫ້ກົງກັບຄວາມຕ້ອງການຂອງທ່ານ. ແຜ່ນຂະຫນາດໃຫຍ່ 1.5x4M ສໍາລັບພື້ນເຮືອນ. Designed for use as ໃສ່ກັບດັກຂີ້ເຫຍື້ອ, ຕົວແຍກຂີ້ເຫຍື້ອ, ດັກໃບ, ແກນຂ້າງຕາມເສັ້ນທາງທາງຫລວງ. ອີງຕາມມາດຕະຖານຂອງເທດສະບານ ກະຊວງສາທາລະນະສຸກແລະເມືອງແລະການວາງແຜນປະເທດ ຖະຫນົນຊົນນະບົດແລະບາງກອກ. 6. Cast ພ້ອມສໍາລັບທາດເຫຼັກ, ຫນຽວແມ່ພິມສໍາລັບທາດເຫຼັກ, ທໍ່ ductile Manhole ກວມເອົາການປົກຫຸ້ມຂອງ. 11 hdg / Stainless Steel Grating Anchor ອຸປະກອນ ທີ່ຕິດຄັດມາ Saddle ແກ້ໄຂ Clip Clamp Lock Fastenal Fastener ອຸປະກອນລັອກຄລິບແນ່ນອນດ້ານເຫຼັກແຜ່ນ sieve, ເຫລັກສະແຕນເລດ /. ເຫລໍກສະແຕນເລດທີ່ມີຊີມມ້ວນສ່ວນໃຫຍ່ແມ່ນໃຊ້ສະຕິກເກັດສະແຕນເລດທີ່ໃຊ້ໃນການຍຶດເອົາເສັ້ນໃຍສັງກະສີຫຼືແຜ່ນສະແຕນເລດ. ແກນເຫລໍກສ່ວນປະກອບ zinc plated ແຕ່ລະແມ່ນອອກແບບມາເພື່ອຕິດຕັ້ງແຜ່ນແກນເພື່ອພື້ນຖານດ້ານລຸ່ມ. ລະດັບສາມາດປັບໄດ້. ທັງສອງແມ່ນຄ້າຍຄືກັນ. ລູກຄ້າສາມາດເລືອກຈາກຂະຫນາດຕ່າງໆທີ່ເຫມາະສົມກັບຂະຫນາດຂອງຕາຫນ່າງແລະຂະຫນາດຂອງຕາຂ່າຍໄຟຟ້າ 12. ຂອບ Tree Guard Grating Paver Frame Cover Grate Frame ປະມານພື້ນຖານຂອງຕົ້ນໄມ້. ທັງສອງ jigsaw ແລະສໍາເລັດ. ການເຂົ້າເຖິງການປົກຫຸ້ມຂອງ, ຈັບແລະກອບຮູບເປັນ | ເວີ້ງໄດ້ STORM ແລະ Sewers. ຜະລິດຕະພັນຂອງໄທຜະລິດແລະມີຫຼາກຫຼາຍຂອງເຄື່ອງຫຼີ້ນຂີ້ເຫຍື້ອຂີ້ເຫຍື້ອ. ຖະຫນົນຂີ້ເຫຍື້ອແລະການກໍ່ສ້າງເພື່ອຕອບສະຫນອງມາດຕະຖານ ASTM ແລະ AASHTO. ນອກຈາກນັ້ນ, ການຫລໍ່ຂອງພວກເຮົາຕອບສະຫນອງຂໍ້ກໍານົດ DOT ຂອງລັດຖະບານກາງແລະລັດ; ແລະເມືອງອື່ນໆ, ມາດຕະຖານເມືອງຫຼືທ້ອງຖິ່ນ. ການທົບທວນຄືນຂອງລູກຄ້າໂດຍປົກກະຕິແມ່ນອີງໃສ່ຮູບຮ່າງ, ຂະຫນາດ, ການຄາດຄະເນການໂຫຼດ, ປະເພດວັດຖຸ, ທາງເລືອກເລືອກແລະປະເພດລັອກ. ກອບຮູບແບບ Manhole ແລະຄອບຄຸມສາມາດເປັນຮູບກົມ, ສີ່ຫລ່ຽມຫລືສີ່ຫລ່ຽມ. ພວກເຂົາເຈົ້າແມ່ນປົກກະຕິທີ່ມີຢູ່ເປັນສະພາແຫ່ງຫນຶ່ງຫຼືກໍານົດໂດຍອີງຕາມການປະຊຸມກັນກ່ອນທີ່ຈະຈັດສົ່ງ. ຖືກນໍາໃຊ້ໃນລະບົບທໍ່ນ້ໍາທົ່ວປະເທດສະຫະລັດອາເມລິກາ. ຢ່າງໃດກໍຕາມ, ອ່າງເກັບນໍ້າຈໍານວນຫຼາຍບໍ່ໄດ້ຖືກອອກແບບມາເພື່ອການດູດຊຶມແລະມົນລະພິດ. ການນໍາໃຊ້ທີ່ເຫມາະສົມຂອງອ່າງເກັບນ້ໍາແມ່ນການປະຕິບັດກ່ອນການປະຕິບັດການຄຸ້ມຄອງຝົນຕົກອີກ. ການປັບປຸງທໍ່ນ້ໍາທີ່ມີຢູ່ໃນປະຈຸບັນອາດຊ່ວຍປັບປຸງການປະຕິບັດຂອງພວກເຂົາໄດ້ຢ່າງຫຼວງຫຼາຍ. A ທາງເລືອກທີ່ຕິດງ່າຍດາຍຂອງຈັບອ່າງນໍ້າແມ່ນເພື່ອໃຫ້ແນ່ໃຈວ່າທັງຫມົດຈັບອ່າງມີ outlet ຄຸມດ້ວຍຜ້າເພື່ອປ້ອງກັນບໍ່ໃຫ້ອຸປະກອນ floatable ເຊັ່ນກະຕ່າຂີ້ເຫຍື້ອແລະ debris, ບໍ່ໃຫ້ເຂົ້າສູ່ລະບົບ th e ຫມໍເດັກ. ບາງເມືອງໃນສະຖາບັນຕ້ອງການທີ່ຈະລຸດຜ່ອນສິ່ງເສດເຫຼືອທີ່ມີຄວາມຊຶມເສົ້າຢ່າງຫຼວງຫຼາຍເພື່ອຫຼຸດຜ່ອນການແຊກແຊງດ້ວຍການໄຫລຂອງການຈະລາຈອນ. ປະລິມານການດູດຊືມໄດ້ຖືກບັນຈຸລົງມາຈາກເສັ້ນຂອງຂົວແລະຂີ້ເຫຍື້ອດັ່ງນັ້ນການຊຶມເສົ້າບໍ່ໄດ້ຂະຫຍາຍອອກໄປຕາມເສັ້ນຂີ້ເຫຍື້ອ. ນີ້ອາດຈະປັບປຸງການຂັບລົດ; ຢ່າງໃດກໍ່ຕາມ, ການຂັດຂວາງການຂັດຂວາງອາດເປັນອັນຕະລາຍຕໍ່ການຈະລາຈອນ. ລະບົບປະຕິບັດການທີ່ສະດວກສະບາຍແມ່ນມີປະໂຫຍດໃນສະຖານະການທີ່ບໍ່ດີແລະສະຖານະການຍ້ອນວ່າພວກເຂົາສາມາດທໍາຄວາມສະອາດຕົວເອງແລະປະສິດທິຜົນຂອງໄຮໂດຼລິກ. ນອກຈາກນັ້ນ, ພວກມັນມັກມັກໃສ່ຂີ້ເຫຍື້ອເພາະວ່າທໍ່ໃສ່ຢູ່ນອກທາງເດີນທາງແລະເຮັດໃຫ້ມີຄວາມສ່ຽງຕໍ່ຜູ້ຂັບຂີ່ລົດຈັກແລະລົດຈັກ. ສໍາລັບພາກສ່ວນທີ່ສຸດ, ເວີ້ງກະຕັນຍູໄດ້ຖືກນໍາໃຊ້ໃນການຕັ້ງຄ່າ sag ໃນ gutters, ຢູ່ໃກ້ຊິດກັບສິ່ງກີດຂວາງການຈະລາຈອນດິນເປຕັງຫລື rails (ບ່ອນເວີ້ງຄວບຄຸມຈະບໍ່ປະຕິບັດ), gutters V ເປັນຮູບທີ່ມີບໍ່ຄວບຄຸມຫລືອຸປະສັກ, ແລະ ditches. ນອກຈາກນີ້ຍັງສາມາດນໍາໃຊ້ເຕົາແກຣນຢູ່ໃນສະຖານະການທີ່ມີປະສິດທິພາບແລະປະສົມປະສານກັບລະບາຍນ້ໍາ. ປ່ອງຢ້ຽມຂີ້ເຫຍື້ອສາມາດປັບຕົວກັບລັກສະນະທາງຖະຫນົນໃນຕົວເມືອງເຊັ່ນ: ທາງລົດໄຟ, ທາງແຍກຕາມຖະຫນົນແລະທາງກາງ. ໃນເວລາທີ່ເຕົ້າສລຸບຕ່ອງໂສ້ແມ່ນກໍານົດ, ການຕັ້ງຄ່າແລະການປະຖົມນິເທດຕ້ອງສອດຄ່ອງກັບຄວາມປອດໄພຂອງລົດຖີບແລະລໍ້ເຫຼື່ອນ. ນ້ໍາເລິກຖືກອອກແບບມາສໍາລັບການລະບາດຂອງການແຜ່ກະຈາຍຢ່າງກວ້າງຂວາງ, ສະພາບການໄຫຼຕໍ່າ. ການປະຍຸກໃຊ້ປະກອບມີການໄຫຼວຽນຂອງແຜ່ນເຈ້ຍຈາກຖະຫນົນຫົນທາງໃນເວລາທີ່ການເກັບກໍາຢູ່ໃນຈຸດສຸມແມ່ນບໍ່ປະຕິບັດ, ຫຼືການໃຫ້ປະໂຫຍດສໍາລັບການໄຫລຂອງ stagnate ທີ່ບໍ່ມີຄວາມສະຖຽນລະພາບ. ນ້ໍາລຽບມີປະໂຫຍດທີ່ບໍ່ມີຊຶມເສົ້າທີ່ຈໍາເປັນສໍາລັບປະສິດທິພາບໄຮໂດຼລິກ. ນໍ້າຖ້ວມໄລຍະຍາວອາດຈະເປັນປະໂຫຍດໃນເຂດທີ່ມີບັນຫາທີ່ມີບ່ອນທີ່ບໍ່ມີປະສິດທິພາບ, ເຊັ່ນ: ຕາມເສັ້ນທາງກາງແລະໃນການປ່ຽນແປງທີ່ສູງ. ສາມາດຕິດຕັ້ງສາຍນ້ໍາແບບລຽບຕາມທາງຂວາງ. ຢ່າງໃດກໍ່ຕາມ, ສາຍນ້ໍາແບບລຽບໆມີຂໍ້ບົກພ່ອງຫຼາຍ: ອ່າງລຽບໆມີຄວາມກະຕືລືລົ້ນສູງທີ່ຈະເກັບຂີ້ເຫຍື້ອໃນການຕັ້ງຄ່າ sag. ການບໍາລຸງຮັກສາປົກກະຕິແມ່ນຕ້ອງການເພື່ອທໍາຄວາມສະອາດຂີ້ເຫຍື້ອຈາກລະບາຍນ້ໍາເຂົ້າ. ການຕິດຕັ້ງສາມາດມີຄວາມຫຍຸ້ງຍາກ. ລະບົບປະສົມປະສານລວມເຊັ່ນການຄວບຄຸມແລະຂີ້ເຫຍື້ອສາມາດເປັນປະໂຫຍດໃນການຕັ້ງຄ່າຫຼາຍໆຢ່າງ, ໂດຍສະເພາະແມ່ນສະຖານທີ່ເກັບມ້ຽນ. ເນື່ອງຈາກບັນຫາທີ່ເກີດຂື້ນໃນຂີ້ເຫຍື້ອທີ່ມີລັກສະນະເປັນປະຈໍາ, ການປະສົມປະສານມີການໄຫຼລົງຖ້າຫາກມີສ່ວນຫນຶ່ງຂອງສິ່ງເສດເຫຼືອເກີດຂື້ນຫຼືຖືກລະເບີດຢ່າງຫນັກແຫນ້ນໂດຍ debris. ການບໍາລຸງຮັກສາທໍ່ປະສົມປະສານແມ່ນມັກຈະສະຫນັບສະຫນູນໂດຍຄວາມຈິງທີ່ວ່າເຕົາອົບແມ່ນສາມາດຖອດອອກໄດ້, ສະຫນອງການເຂົ້າເຖິງໄດ້ງ່າຍໃນລະບົບທໍ່ລະບາຍນ້ໍາແລະລະບົບນໍ້າຖ້ວມທີ່ກ່ຽວຂ້ອງ. ລະບົບປະສົມປະສານທີ່ນໍາໃຊ້ໃນຊັ້ນຮຽນໂດຍປົກກະຕິບໍ່ແມ່ນຄ່າໃຊ້ຈ່າຍທີ່ມີປະສິດຕິຜົນຍ້ອນວ່າມີຄວາມສາມາດເພີ່ມຂື້ນຕື່ມອີກ. ຂໍ້ມູນທີ່ຖືກຕ້ອງກ່ຽວກັບການປະສົມດັ່ງກ່າວແມ່ນບໍ່ພຽງພໍທີ່ຈະສ້າງປັດໃຈທີ່ຖືກຕ້ອງສໍາລັບການກໍານົດຄວາມສາມາດທີ່ແທ້ຈິງຂອງການນໍາເຂົ້າປະສົມປະສານ. ສໍາລັບການຄວບຄຸມການປະສົມປະສານແລະຄວາມຮູ້ບຸນຄຸນ, ສົມມຸດວ່າຄວາມສາມາດຂອງປະສົມປະສານລວມປະກອບດ້ວຍຄວາມສົມບູນຂອງຄວາມອາດສາມາດຂອງຂົວແລະຄວາມຍາວຂອງການເປີດກວ້າງຂື້ນ. ຂັດຂວາງຄວາມສາມາດຂອງການເປີດປິດກັ້ນທີ່ຢູ່ໃກ້ກັບການເປີດທໍ່. ເຂົ້າໃນການຕັ້ງຄ່າ sag ແມ່ນພິຈາລະນາ “ຈຸດສິ້ນສຸດຂອງສາຍ” ເນື່ອງຈາກນ້ໍາແລະຄວາມເສຍຫາຍຂອງມັນບໍ່ມີບ່ອນອື່ນທີ່ຈະໄປ. ເນື່ອງຈາກວ່ານີ້, ຄວາມລົ້ມເຫຼວຂອງເຂົ້າໃນການຕັ້ງຄ່າ sag ມັກຈະເປັນການປະຕິບັດງານທີ່ປະສົບຜົນສໍາເລັດຂອງລະບົບລະບາຍລົມ. ດັ່ງນັ້ນ, ຜູ້ອອກແບບໄຮດໍລິກຕ້ອງພິຈາລະນາບາງລາຍການເພີ່ມເຕີມເຊັ່ນ: ຫນອງສະລັບສັບຊ້ອນແລະວິທີການທາງດ້ານຊອຍສະລັບສັບຊ້ອນ. ໃນການຕັ້ງຄ່າ sag, ມີຄວາມສາມາດຄວບຄຸມການຄວບຄຸມລະດັບກາງເປັນຫນຶ່ງໃນສອງຕົ້ນກໍາເນີດ. ການເຂົ້າໄປໃນຕົວເອງອາດເຮັດໃຫ້ຫົວທີ່ແປເປັນຄວາມກວ້າງທີ່ມີນ້ໍາຫນັກແລະການໄຫຼເຂົ້າໃນຂົວແລະຂີ້ເຫຍື້ອຈາກແຕ່ລະທິດຊີ້ໃຫ້ເຫັນຄວາມກວ້າງຂອງຕົນເອງ. ຖ້າ sag ຢູ່ໃນເສັ້ນໂຄ້ງທາງຂວາງ, ເປີ້ນພູທີ່ຢາດແມ່ນສູນ, ຊຶ່ງຫມາຍຄວາມວ່າບໍ່ມີຄວາມສາມາດໃນການຂຸດຄົ້ນ. ໃນຄວາມເປັນຈິງແລ້ວມີຮູບແບບການໄຫລຂອງສາມມິຕິທີ່ເປັນຜົນມາຈາກຜົນກະທົບຂອງການຫຼຸດລົງ. ເປັນການສົມທຽບ, ວິທີຫນຶ່ງທີ່ສົມເຫດສົມຜົນແມ່ນການສົມມຸດຄວາມຍາວຂອງທິດຕາເວັນຕົກຂອງເຄິ່ງກາງ. ເນື່ອງຈາກວ່ານ້ໍາຫຼືຄວາມເສຍຫາຍຂອງມັນບໍ່ສາມາດຕັ້ງຢູ່ບ່ອນອື່ນ, ຄວນໃສ່ລະຫັດຄວາມປອດໄພທີ່ເຫມາະສົມກັບການໃສ່ຂະຫນາດ. ສໍາລັບທໍ່ກະປ໋ອງໃນຖົງ, ປັດໃຈຄວາມປອດໄພປົກກະຕິແມ່ນປະມານສອງ; ສໍາລັບທໍ່ລະບາຍຄວັນ, ປັດໃຈອາດຈະນ້ອຍລົງ. ໃນການນໍາໃຊ້, ປັດໄຈທີ່ມີຄວາມປອດໄພສໍາລັບທໍ່ສົ່ງທໍ່ແມ່ນນໍາໃຊ້ເປັນການຫຼຸດຜ່ອນປັດໄຈຄວາມປອດໄພ, ຫຼືປັດໄຈທີ່ກີດຂວາງ. ຕົວຢ່າງ, ປັດໄຈຄວາມປອດໄພຂອງ 2 ຈະສົ່ງຜົນກະທົບຕໍ່ປັດໄຈທີ່ກີດກັ້ນຂອງ 50% ເຊິ່ງຄາດວ່າເຕົາເຜີ້ງແມ່ນເຄິ່ງຫນຶ່ງຂັດຂີ້ເຫຍື້ອ. ບ່ອນທີ່ນ້ໍາທີ່ສໍາຄັນສາມາດເກີດຂຶ້ນເຊັ່ນ: ໃນຜ່ານກ້ອງແລະໃນ curve sag, ຕັ້ງ, ປະຕິບັດວິສະວະກໍາທີ່ດີແມ່ນການຈັດວາງເວີ້ງ flanking ທັງສອງຂ້າງໃຫ້ inlet ສະຖານທີ່ sag ເພື່ອບັນເທົາອາຫຼືບາງທີ່ສຸດຂອງພາລະໄຫຼໃນ inlet ໃນ sag ໄດ້. chutes ບາຍນ້ໍາ, ຍັງເອີ້ນວ່າທໍ່ລະບາຍໃນໄລຍະຂ້າງຄຽງຫຼືຄວບຄຸມສະລັອດຕິງ, ໄດ້ຖືກນໍາໃຊ້ທົ່ວໄປຢູ່ສົ້ນຂອງຂົວທີ່ຈະບໍ່ວ່າຈະປ້ອງກັນບໍ່ໃຫ້ໄຫຼຈາກແລ່ນໃສ່ສຽງຂົວ, ຫຼືເພື່ອປ້ອງກັນການໄຫຼຈາກແລ່ນອອກສຽງຂົວໃສ່ pavement ໄດ້. ອາດຈະມີສະຖານທີ່ອື່ນໆທີ່ເປັນ chute ບາຍຫລືຕັດການຄວບຄຸມອາດຈະເປັນປະໂຫຍດໃນການຖອນການໄຫຼຈາກ pavement ທີ່ບໍ່ມີລະບົບລະບາຍປົກຄອງແມ່ນປະຈຸບັນແລະທີ່ outfall ທີ່ເຫມາະສົມແມ່ນປະຈຸບັນທາງຫລັງຂອງການຄວບຄຸມແລະ gutter ສ່ວນ. ໃນກໍລະນີຫຼາຍທີ່ສຸດ, ການເປີດກວ້າງຂອງການຄວບຄຸມຈະເຊື່ອມຕໍ່ກັບຊ່ອງທາງທີ່ທົນທານຕໍ່ການສັ່ນສະເທືອນຫຼືການຫຼຸດລົງທີ່ປ້ອງກັນການເຊາະເຈື່ອນຂອງທໍ່ຫຼືຄວາມຊັນ. ໃນບາງກໍລະນີ, ຊ່ອງທາງຫຼືຊ່ອງຫຼຸດລົງອາດຈະຖືກທົດແທນດ້ວຍທໍ່ທີ່ຢູ່ໃນຖະຫນົນທີ່ຂື້ນດັ່ງທີ່ໄດ້ສະແດງໃນຮູບທີ 10-8. ການປິ່ນປົວນີ້ສະຫນັບສະຫນູນການບໍາລຸງຮັກສາແລະການບໍາລຸງຮັກສາອື່ນໆ, ແຕ່ຍັງແນະນໍາຄວາມຕ້ອງການບໍາລຸງຮັກສາຂອງຕົນເອງເພື່ອປ້ອງກັນບໍ່ໃຫ້ເກີດການຂັດຂວາງ. ໄດ້ Inlet ທີ່ຢູ່ອາດຈະໄດ້ຮັບບໍ່ວ່າຈະໂດຍຖະຫນົນ, dictated ອົງປະກອບຂຶ້ນ, ຄວາມຕ້ອງການບົບໄຮໂດຼລິກ, ທັງສອງຫຼືຕື່ມ. ເວີ້ງຄວນໄດ້ຖືກບັນຈຸນ້ໍາຂອງອົງປະກອບທີ່ມີຖະຫນົນ ເຊັ່ນ sags, ແຍກຖະຫນົນເກາະ gore (ເບິ່ງຮູບສະແດງທີ 10-9), ຕຣາການປ່ຽນແປງສູງ Super, driveways, ຂ້າມຍ່າງ, ແລະຢັບຢັ້ງ ramps (ເບິ່ງວິທີ Bypass Flow ການອອກແບບ). ໄຫຼຂ້າມທາງແຍກ, ramps, ແລະ ໃນລະດັບຫນ້ອຍ, driveways, ອາດຈະເຮັດໃຫ້ເປັນອັນຕະລາຍການຈະລາຈອນໄດ້, ໃນຂະນະທີ່ການໄຫຼທົ່ວຍ່າງຂ້າມແລະ ramps ຄວບຄຸມອາດຈະເຮັດໃຫ້ອັນຕະລາຍຄົນຍ່າງຕີນ. ທົ່ງຫຍ້າໃນສະຖານທີ່ເຫຼົ່ານີ້ຄວນໄດ້ຮັບການອອກແບບມາເພື່ອເກັບກໍາ 100% ຂອງການໄຫຼ. ທໍ່ລະບາຍນ້ໍາຄວນຖືກຕັ້ງຢູ່ໃນໄຮດໍລິກເພື່ອປ້ອງກັນການໄຫຼເຂົ້າໄປໃນອ່າງນໍ້າແລະການລ້ຽງຫນອງຫຼາຍເກີນໄປ. ທໍ່ລະບາຍນ້ໍາເກັບນ້ໍາຈາກເສັ້ນທາງແລະບ່ອນຈອດລົດແລະສົ່ງມັນໄປສູ່ລະບົບທໍ່ລະບາຍນ້ໍາໃຕ້ດິນ. ລະບົບລະບາຍນ້ໍາປະສົມປະສານເຂົ້າໄປໃນລະບົບຄວບຄຸມແລະລະບົບທໍ່ນ້ໍາຖືກເອີ້ນວ່າທໍ່ລະບາຍ. ທໍ່ລະບາຍນ້ໍາມີຜົນປະໂຫຍດດ້ານຄຸນນະພາບນ້ໍາຫນ້ອຍດຽວ; ຢ່າງໃດກໍ່ຕາມ, ໃນເຂດທົ່ງພຽງທີ່ພັດທະນາ, ພວກມັນມັກຈະເປັນອົງປະກອບທີ່ຈໍາເປັນຂອງລະບົບການລະບາຍນ້ໍາເປັນທັງຫມົດມີຜົນປະໂຫຍດທີ່ມີຄຸນນະພາບນ້ໍາ. ມີອົງປະກອບການອອກແບບທີ່ສາມາດນໍາເຂົ້າເຂົ້າໄປໃນທໍ່ລະບາຍນ້ໍາເພື່ອບັນລຸຜົນປະໂຫຍດທີ່ມີຄຸນນະພາບນ້ໍາບາງຢ່າງ. ປ້ອງກັນການໄຫຼຂອງນ້ໍາທີ່ຕົກລົງຈາກຂີ້ຝຸ່ນຕາມຖະຫນົນແລະຫຼຸດຜ່ອນຄວາມໄວໃນການໄຫຼອອກຈາກ culverts / curbs ໂດຍການທໍາລາຍພະລັງງານ. ດັບເວັບໄຊທ໌ :.Www.chancon.co.th | Http://GratingThai.com | Http://GratingThai.co.th | http: // Fiberglass Grating – .com ໄດ້ pitting ຫລວງທໍ່ຫລວງ.